The much anticipated upgraded version of the Uni-Kit Epson Resetter (Version 5.0) is now available at 123 Refills. The upgraded model works with newer Epson printer models. 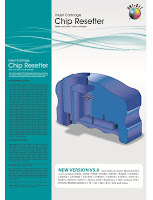 123 Refills expects to release compatible chips for the HP 564 ink cartridges, which would be first or early to retail market with a complete refill solution for the HP 564 and HP 564xl inkjet cartridges, allowing users to successfully refill the cartridges and with a new chip, ensure that the printer recognizes them. Currently, end users need to ignore the "low ink" level when using refilled HP 564 ink cartridges, but with new HP 564 chips this will no longer be an issue. Canon has launched new printers including the Canon IP4920, MG5320 - all of which have been tested with our compatible canon ink cartridges to work perfectly. Our compatible LC75 ink cartridges work on all these Brother inkjet printers.